This card uses a watercolour background that I created a while ago with Brusho Colour Crystals. When I'm creating backgrounds, I generally make several so there are always some waiting in my craft room to be used! The flowers are created with the Serene Garden Bundle, which I love (and the 10% saving was a bonus!). I stamped them with Mango Melody ink onto Crushed Curry cardstock and added some shading by watercolouring with some more Mango Melody ink. I then cut them out with the coordinating dies. I cut the leaves from Call Me Clover cardstock and then embossed with the matching embossing piece using the Natures Roots Framelits. 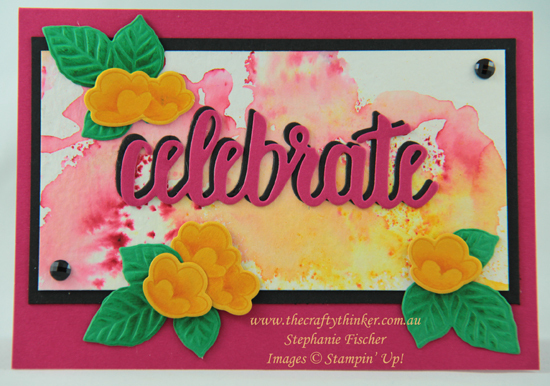 Sponging with a little Call Me Clover ink added a little definition to the leaves by enhancing the embossed lines. I cut the word "Celebrate" twice: once with Basic Black cardstock and once with Lovely Lipstick cardstock and offset them a little when I adhered them to the card front. The card layers are Lovely Lipstick, Basic Black, watercoloured Watercolor Paper and there are some Faceted Dots in the corners.